The royal baby had parents clicking like crazy for all his outfits. There was never any question that Prince George was going to captivate the world. If being English royalty weren’t enough, he’s the son of the most popular couple the English crown has seen in a long time. 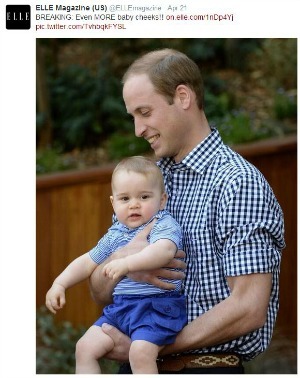 And while it’s usually mom, Kate Middleton, that has the fashion elite swooning, the royal family’s tour of Australia and New Zealand has also turned little George into a fashion plate. “Every mother, especially the British ones, dream of dressing their children like the royal baby,” Christine Innamorato, creative director of fancy children’s clothier Bonpoint, told The New York Times. One company, Early Days, which has been around since 1952 and is based in Leicester, England, had to shut down online sales because demand was too great after George was seen in the company’s “prewalkers.” The shoes generally sell at around US$50. And Rachel Riley, whose children’s designs have been worn by little George throughout the trip, says she’s already seeing the business benefit of the royal connection. A pair of short paints he wore with a sailboat design on them sold out in hours. The same can be said for the blue cardigan he wore while deplaning in Canberra. And the outfit he wore while meeting a bilby. All of those pieces are $75 to $99 apiece. The kangaroo backpack that pop Prince William was seen carrying early in the 19-day trip had already sold out. But those who want to get their hands on one can pre-order it for $14.95. It’s the same impact that the “Kate effect” has had: a mad rush to retailers who make or sell the items that are seen on both the Duchess and her little boy. It helps that the clothes are affordable enough for commoners to indulge in. It’s interesting because we tend to think that rarity or high cost are hallmarks of the “most desired thing.” That which is out of reach automatically becomes that thing you want. To get that aspirational thing, customers will save, scour the internet, sleep on the sidewalk and otherwise go out of their way. But nowadays, the internet has put a premium on accessibility. Those brands that make their goods available to anyone who wants them are rewarded with site crashes and back orders, a sign of robust business. It also helps that celebrities tend to be tastemakers, if, in some cases, only minor ones. In the case of Prince George, he kind of surpasses celebrity by being an actual heir to a real throne. In fact, Business Insider just this week anointed George the most powerful person in the world in the 0-year-old age group. Ha. Buzzfeed pulled together some gifs of the Prince laying the law down on his subjects, so BI might not be so far off. Good looks and power are a winning combination. And because it’s Friday and we’re obsessed with this whole family and the things they do, thiiiss.